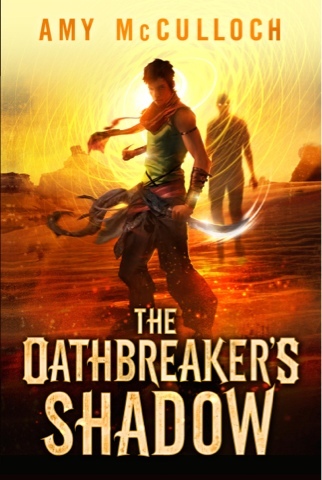 Empire of Books: The Oathhreaker's Shadow cover unveiled! "Fifteen-year-old Raim lives in a world where you tie a knot for every promise that you make. Break that promise and you are scarred for life, and cast out into the desert. Raim has worn a simple knot around his wrist for as long as he can remember. No one knows where it came from, and which promise of his it symbolises, but he barely thinks about it at all—not since becoming the most promising young fighter ever to train for the elite Yun guard. But on the most important day of his life, when he binds his life to his best friend (and future king) Khareh, the string bursts into flames and sears a dark mark into his skin. Scarred now as an oath-breaker, Raim has two options: run, or be killed. A gripping YA action-adventure fantasy, the first part of a planned duology"
And it's going to be a hardback! It's going to be one stunning book and one to look out for!